We need a van, man! 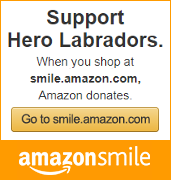 Hero Labradors NEEDS a van. Not because we need to eat a steady diet of government cheese while we live down by the river, but because we NEED a safe and reliable way to transport our adult dogs and puppies to the vet, to local events, and to deliver our pups to training organizations across the United States. ANY Amount helps--whether it's $1 or $10,000. We will also be wrapping the van with our logo, and with the logo of any business that donates $1500 or more. How about that! Advertising across the country, and helping our Nation's Heroes! And not a blah design either, we have some of the BEST graphic designers in the country working to make this really pop! Would you like to do a fundraiser but are stuck on ideas? A bake sale! Always a favorite for me, because, well, cookies. A dog walking event--great for kids! Kids canvass neighborhoods and get people to pledge money for them to walk their dogs for a week. (Or once, or whatever.) The kid walks the dog, the dog gets exercise, money is raised! Ripley is learning to walk and play.